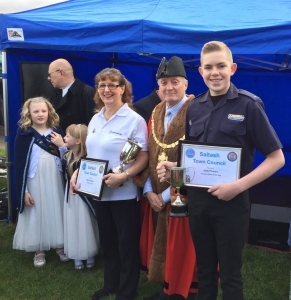 saltash.net student, Jack Phelan, was awarded at this year’s May Fair as the Saltash Young Citizen of the Year, for his inspirational work highlighting areas of safety concerns in the local community. Saltash Mayor, Bill Phillips, was on hand to honour Jack at the opening event in Longstone Park. Jack, who is in Year 9, is currently trying to raise £3,000 to install a public access iPAD SP1 Defibrillator in Saltash, to be located outside the fire station. So far Jack has raised £968, part of which came from a Christmas raffle that Jack and other students arranged at saltash.net. Jack is a Fire Cadet at Saltash with Cornwall Fire and Rescue Service and uses his Twitter account to raise awareness and campaign for community safety. The May Fair’s opening event also saw the Mayor’s Best Performance Cup for 2015-16 be awarded to the amazing cast and crew of saltash.net’s ‘Annie’. Mollie Willis, who played the role of Annie, and Molly Banks, who played Miss Hannigan, received the cup from the Mayor on behalf of everyone at saltash.net.